"An ounce of prevention is worth a pound of cure," the saying goes. Although Benjamin Franklin was referring to fire safety when he coined this phrase, it's often used in relation to health and healthcare these days. And it's really true! Taking steps to prevent health problems when you can may be easier – in some cases – than repairing the damage after the fact. This axiom certainly applies to dentistry. You are preventing cavities, gum disease and other dental problems every day, when you brush and floss. 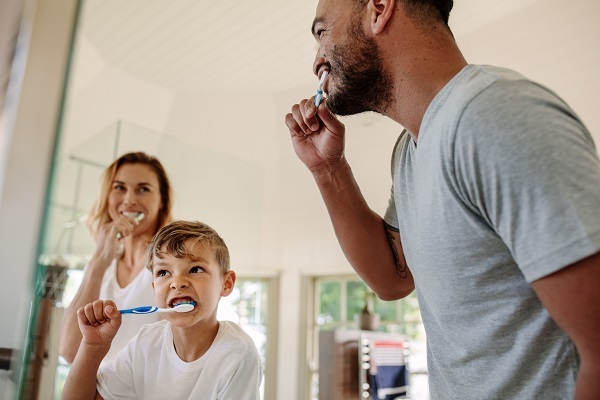 Your routine visits to our practice provide a deep cleaning, and allows our dentists to look for early signs of problems, stopping them before they advance. Consider making the switch to an electric toothbrush, if you haven't already. Electric toothbrushes automate the brushing process so that you don't have to do as much work. You may find it easier and more comfortable to use an electric toothbrush. Brush for two minutes each time, and use "good form." Two minutes is generally the recommended duration for brushing. Some electric toothbrushes have a built-in timer. You can also keep an eye on the clock. Floss once a day, every day. Flossing is important because it removes food and plaque from in between your teeth. When brushing and flossing are combined, you are cleaning all of the teeth surfaces. "What is dental plaque?" This sticky film of bacteria is constantly forming on your teeth. It is made up of these naturally occurring bacteria, as well as bits of food and saliva. The bacteria lead to cavities because of the acid they produce. Brushing with fluoride and flossing reduces the amount of bacteria present. Cleanings and checkups remain an important part of your overall hygiene habits. Our experienced dental hygienists remove plaque and tartar that is impossible to remove with your brush and floss. They also polish your teeth for that clean feeling you get after your appointment. During the exam, the dentist checks your gums, teeth and entire mouth. They look for any dental problems and talk to you about any issues or symptoms you may be experiencing. Our goal is to keep your oral health on track, so that you can smile confidently! While you're here, we hope you'll navigate around our redesigned website. It's easier to use, features more photos of our staff and our office, and is packed full of information about dental services.